Cape May County Zoological Society New at the Zoo!! New at the Zoo!! Come meet ‘Jilly’ an 8 week old Holstein calf, our newest resident in the Barnyard. 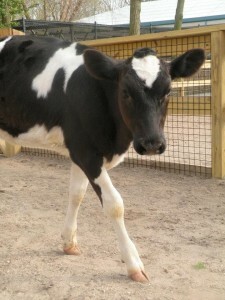 Jilly was purchased by the Cape May County Zoological Society. She will eventually tip the scales at about 1,300 lbs! Come to the zoo and see her while still a baby. This entry was posted in Coupons and tagged Cape May County Zoo, Cape May County Zoological Society New at the Zoo on April 23, 2013 by Ryan Reclaim.